This is an amazingly healthy alternative to conventional chocolate mousse: a dairy-free, not-too-sweet, cocoa-rich mixture, made buttery and smooth with ripe avocado. Place all the mousse ingredients in a blender and blend until smooth, scraping the sides down a few times during blending. 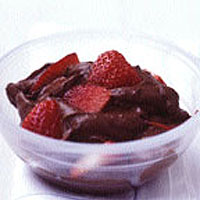 Then simply spoon the mousse into dessert bowls and top with strawberries.